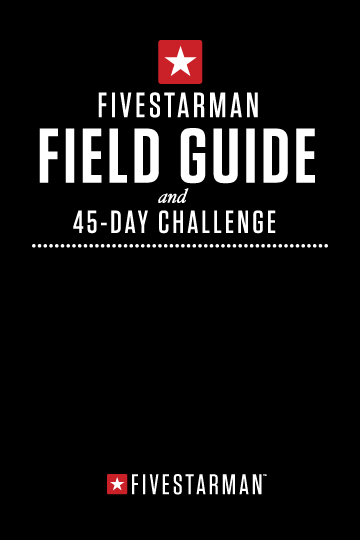 The online version of the 45-Day Challenge is designed to work in tandem with the printed version of the Fivestarman Field Guide and 45-Day Challenge. The purpose of the handy, pocket-sized printed guide is to allow you to carry it with you everywhere you go throughout the day so that you can refer to each day’s challenge and keep yourself on track whether you have access to the web version or not. The web version provides more in-depth resources than the printed guide allows and is here to encourage you to join in the conversation with other like-minded men. So we encourage you to obtain your copy of the Fivestarman Field Guide and 45-Day Challenge and carry it with you throughout the day, then when time allows, visit challenge.fivestarman.com to participate in the conversation and chart your course to greatness. Your First Challenge: Step out of your comfort zone. Encourage others to stick with the challenge and see it through to completion. Your simple, honest answers and thoughts may be just the spark another man needs to help him in his quest to join the ranks of authentic manhood. Each day we will focus on one of the five passions of authentic manhood. We begin with a PRECEPT. A precept is an established and foundational truth that is unchangeable, irrevocable, and eternal. We will then interpret the precept into a PRINCIPLE. A principle gives us clear understanding for the universal nature of the precept. We will embolden the principle so that it is easily recognized. We then put the principle into PRACTICE. We must apply the principle into our lives. We will give you achievable steps to do so. TODAY’S CHALLENGE may seem simple at times, at other times it may seem impossible. You should make every effort to take the spirit of the Challenge and implement it. If you do, you will be amazed at the results you achieve over the period of just 45 days. Finally, you should record your ACTION STEPS. The steps of a good man are order by the Lord (Psalm 37:23). Write down your thoughts, actions, even your committal prayers for this Challenge.